Posted on Tue, Mar 13, 2012 : 9:03 a.m.
A quick and flavorful lamb stew with potatoes, onions and carrots, for St. Patrick's Day. 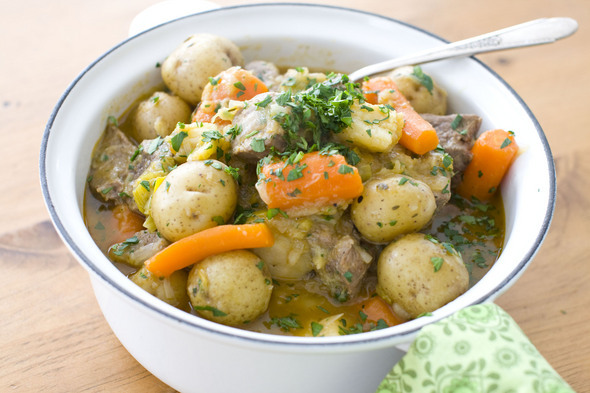 The good news is that making a far more flavorful version of this stew isn't all that difficult, and your efforts are rewarded with a rich, brothy meal with layers of flavor that complement — rather than compete with — the core ingredients. And no open fire or all-day simmering needed. In a large Dutch oven or heavy bottomed pan over medium-high, heat the oil. Working in batches, Add the lamb to the pan and sear on all sides, making sure not to overcrowd the pan. As each batch is browned, use a slotted spoon or tongs to transfer it to a plate. When all the lamb has been seared, add it all back to the pan. Add the leeks, onions, carrots, parsnips, broth, bay leaves and thyme. Bring the mixture to a simmer, then cover and cook for 1 hour. After 1 hour, add the potatoes and continue to cook until the potatoes and the lamb are tender when pierced with a fork, about another 30 minutes. Nutrition information per serving (values are rounded to the nearest whole number): 490 calories; 130 calories from fat (27 percent of total calories); 15 g fat (5 g saturated; 0 g trans fats); 95 mg cholesterol; 52 g carbohydrate; 37 g protein; 10 g fiber; 860 mg sodium.